The term "wiki" refers to a social computing system that allows a group of users to initiate and evolve a hyper-linked set of web pages using a simple markup language. Wiki collaboration systems encourage student-centered learning environments, because they encourage students to be co-creators of course content. 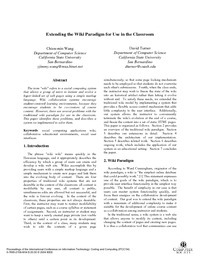 However, there are several problems with the traditional wiki paradigm for use in the classroom. This paper identifies these problems, and describes a system we implemented to solve them.